Green Oil Solutions is achieving its growth goals. Having reached the benchmarks for this opening year in local accounts, GOS has rightly begun its expansion program throughout the State of Florida and into the South East region. Account Representatives are being placed in major markets such as St. Pete, Tampa, Jacksonville, Savannah and the existing Central Florida areas. On average we are adding a new part to the Solution every business day. Our most recent efforts have established us as a viable service provider in Jacksonville. 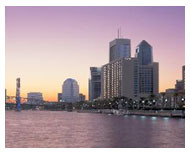 River City Brewing Company and the Hyatt Regency Jacksonville Riverfront are landmarks of the downtown areas in Jacksonville. They are recognizable and in key locations to establish a great presence in the Jacksonville business community. River City Brewing Company is a brewery/seafood establishment that has been providing the folks of Jacksonville with a quality dining experience for over a decade. Located on Museum Circle and situated perfectly for a panoramic of the riverfront, this restaurant is a must for sampling the offerings of Jacksonville. Don’t forget to try the beer! The Hyatt Regency Jacksonville Riverfront is within walking distance of the Landing, a collection of entertainment and dining. It is also one of the centerpieces of the Riverfront on Coastline Dr and within walking distance of most of the amenities of downtown. Staffed and Managed by the expert quality that comes with being a Hyatt Regency, this hotel can accommodate several large conventions or provide an intimate getaway to a historic Southern City. Green Oils will be highlighting new clients that are making the effort to help the environment and be more sustainable. When we establish a new part to the Solution, particularly in new markets we will be giving credit where credit is due. We look forward to writing similar articles for St. Pete, Tampa and Savannah in the near future.